The Colorado River is essential to the social, environmental, and economic sustainability of the American West. In cities like Phoenix, Denver, and Las Vegas, the Colorado River contributes to the water supplies of more than 1 in 10 Americans. After nearly two decades of drought in the West and growing concern over climate change impacts, an official declaration of shortage on the Colorado River is a real and growing possibility. These challenges also present windows of opportunity for communities to develop innovative solutions to ensure resilient and sustainable water supplies. 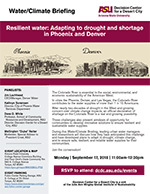 During this Water/Climate Briefing, leading urban water managers and researchers will discuss how they have anticipated this challenge and have developed plans to adapt to drought, climate change, and to ensure safe, resilient, and reliable water supplies for their communities.